As I've mentioned before, I'm not one to make resolutions to kick off the year since I feel like each day brings opportunities to reflect on ways I can be a better mother, wife, friend, daughter, etc. Am I giving and showing love the best I can, am I creating a warm and happy home for my family, am I giving my time and energy to things that make a difference, are my expectations and goals both for myself and my family in check, am I present and available to my children when they need me, am I modeling patience and kindness even when it's tough... These are things I pray for and I'm grateful for the fresh start each day brings, not just each January. Thankfully, I did not botch it up (though my chocolate curls could use some practice) and was rather proud of my first attempt! I only wish I could have assembled it when it was still light out so that I'd have good photos to show you and do the cake its proper justice. Growing up, I looked forward to this dessert as much as I did the arrival of Santa. My Mum tops her with these small wooden angels she bought when we lived in Germany, which, now that I've proven myself worthy ;), are about to become mine. They will be among my most treasured items. So, now for the recipe(s)... This is not a difficult recipe (thanks to all my Mum's guidance and past experience), but it is time consuming and will result in a kitchen full of dirty dishes. Plan to order pizza or have dinner out the day you make this because you won't feel like cooking once you get everything cleaned up. Combine egg whites and cream of tartar in the bowl of an electric mixer. Beat on medium, with the whisk attachment, until soft peaks form. Gradually sprinkle in sugar, beating at high speed until mixture is very stiff and dull looking. Scrape mixture into a pastry bag. Pipe round, button shapes to make mushroom caps onto parchment lined baking sheets. Pipe pointed "kiss" shapes about 1 inch tall to make stems. Dust with cocoa. Bake two hours in 200 degree oven. (TIP: DO NOT use convection bake) After 2 hours, turn off the oven and leave the mushrooms inside for another hour until they're completely cooled. Assemble the mushrooms: Place chocolate in microwave safe bowl and cook till almost melted. Stir with spoon until completely melted and smooth. 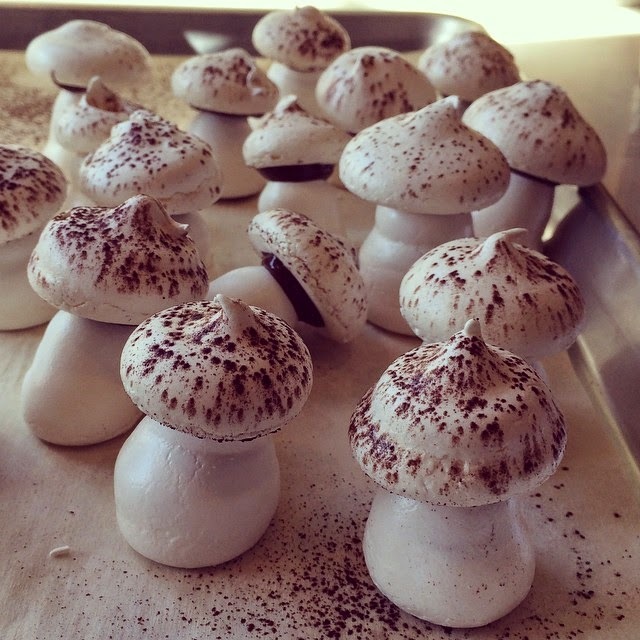 Spread a little chocolate on the flat side of each meringue mushroom cap. Use a sharp knife to cut off and discard the pointed end of the meringue stems. Attach stem to cap while chocolate is still soft. Set assembled mushrooms aside until the chocolate has dried and caps and stems are glued together. They can be made up to 3 weeks ahead of time and stored in an air tight container at room temperature. I always liked how my Mum's cake had the curls, rather than chocolate icing. I had never made these and with my first attempt I didn't spread the chocolate thin enough so my curls were too thick and rather out of proportion. The second time I got busy making the potatoes and the chocolate had hardened too much. Good news is that no matter how they look they taste really good! I figure bark on a real log isn't perfect either. Just adds to the whimsy. Chop chocolate and melt in a small metal bowl over a saucepan with barely simmering water, heat until melted. With a metal spatula spread the melted chocolate onto a baking sheet (not non stick) as thinly and evenly as possible. Cool chocolate until firm to the touch, but not hard. With a metal pastry scraper held at an angle, scrape chocolate slowly from the sheet, letting it curl. Carefully transfer curls to a plate lined with parchment paper. Refrigerate, covered, until ready to use. Can be made 1 day in advance. Place cranberries in a colander in the sink, first rise with water, then pour cranberry juice over them to make them sticky, toss with lots of sugar and place on a parchment lined baking sheet. Then store in the fridge for at least an hour, up to a day, until ready to use. Again, these are just for decoration, though if you like really tart things, you could eat them. stands on the counter. Starting on the bottom and working your way up, add almond slices. Store in airtight container at room temperature if making them a day in advance. 1. grease the bottom of a 15.5 x 10.5 x 1 inch jelly roll pan; line with waxed or parchment paper; grease lightly. Preheat the oven to 375. In a large bowl of an electric mixer beat egg whites at high speed until soft peaks form when the beater is slowly raised. 2. Add 1/4 cup sugar, 2 TBS at a time, beating until stiff peaks form when beater is slowly raised. In a clean bowl beat the egg yolks at high speed, adding remaining 1/2 cup sugar, 2 TBS at a time. Beat until mixture pale and very thick - about 4 minutes. 3. At low speed, beat into egg yolk mixture, cocoa, vanilla, and salt, just until smooth. With a wire whisk or rubber scraper using an under-and-over motion, gently fold the coca mixture into the beaten egg whites, just until they are blended (no egg white should show). 4. Spread evenly in pan. Bake 15 minutes, just until surface springs back when gently pressed with fingertip. Sift confectioners' sugar (VERY LIBERALLY) on a clean ,linen dish towel (Tip: use a thick dish towel, without a pattern on it) Flip warm pan onto dish towel and gently lift off the pan. I laid the dish towel over a large wire cooling rack, not sure that was necessary but I felt like it helped. This is a bit of a tricky step just because it is awkward, I was afraid the cake would fall (er, fly?) out and break. I didn't have any trouble though. Beginner's luck? After you've lifted the pan off the cake, remove the paper backing on the cake. 5. Roll up, jelly roll fashion, starting with the short end, towel and all. Cool completely on rack, seam side down - at least 1/2 hour. To make filling: Combine ingredients in medium bowl. Beat with electric mixer until very thick and then refrigerate. 6. Unroll cake: spread with filling to 1 inch from edge; re-roll. Place seam side down on a serving platter; cover loosely with foil. Refrigerate 1 hour before serving. Top cake with chocolate curls. 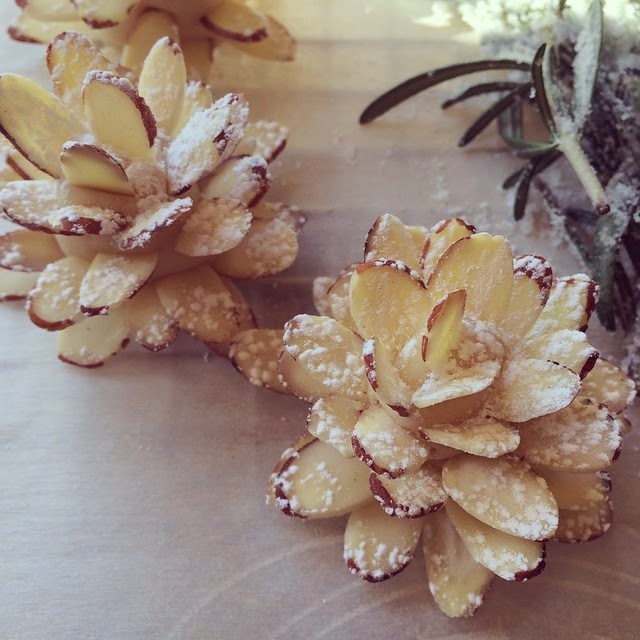 Adorn platter with forest garnishes (rosemary sprigs, cranberries, mushrooms, and pinecones). Dust top of cake with confectioners sugar. Ohhh and ahhh, take pictures and then serve it up! :) Dip long knife in a glass of warm water before slicing each slice to make clean and pretty slices. And top each plate with a couple meringue mushrooms. I've never attempted this either . . . and you've made it look so easy. 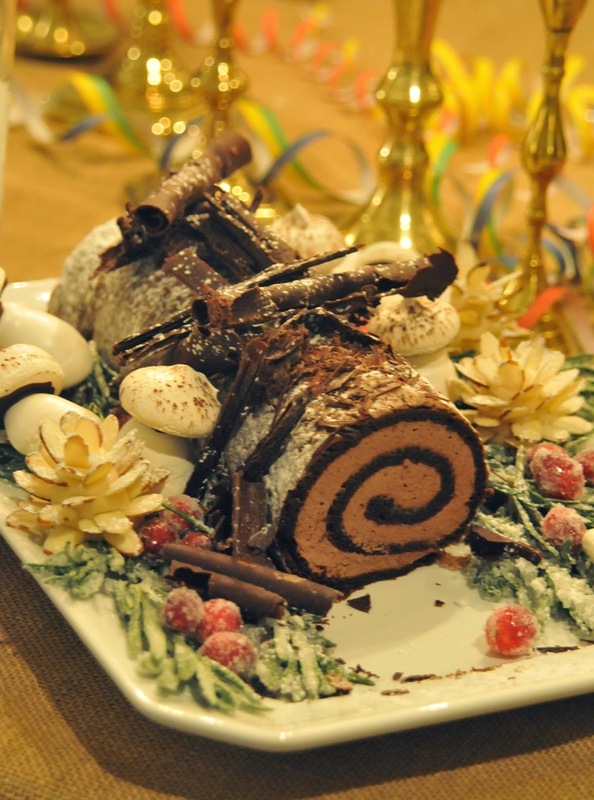 This may be our Christmas dessert next year! So pretty and love the tradition behind it. The little wooden angels surely will be a treasure to you! Love when there is so much meaning behind things like this! Happy New Year! That's one of the most beautiful cakes I've ever seen. Amazing job! This cake is amazing! I just made your chocolate cake in a Bundt pan. It was quite easy to make and delicious. 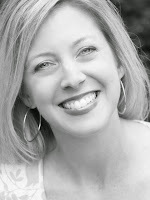 Your blog is one of my favorite places for inspiration and recipes. Thank you! The desserts look pretty good up there and it seems like you've had a great dinne! (good way to start a year!) It's nice to know that you reflect on yourself and give yourself goals every day! Have a Happy New Year! 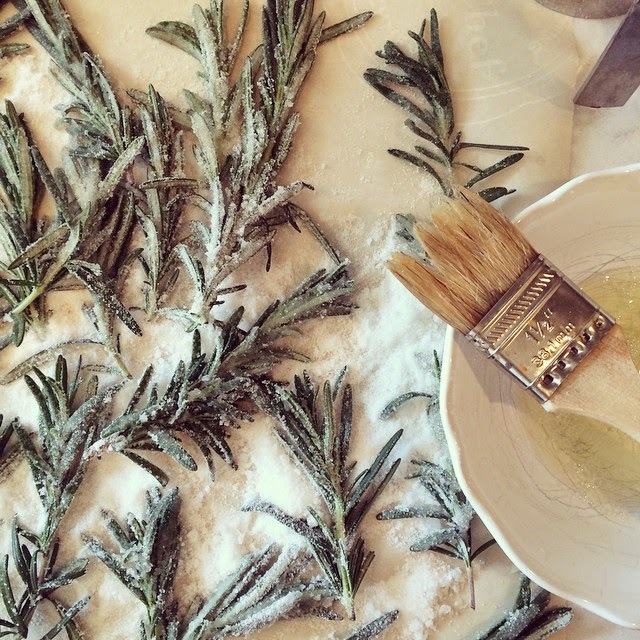 I'm attempting this beautiful dessert for Christmas Eve dinner this year! Looking over the ingredients, I noticed you said to use 1/4 of unsweetened cocoa for the filling ingredients... Is that 1/4 a cup? Thanks so much for sharing! Hopefully mine looks as beautiful as yours! Merry Christmas!